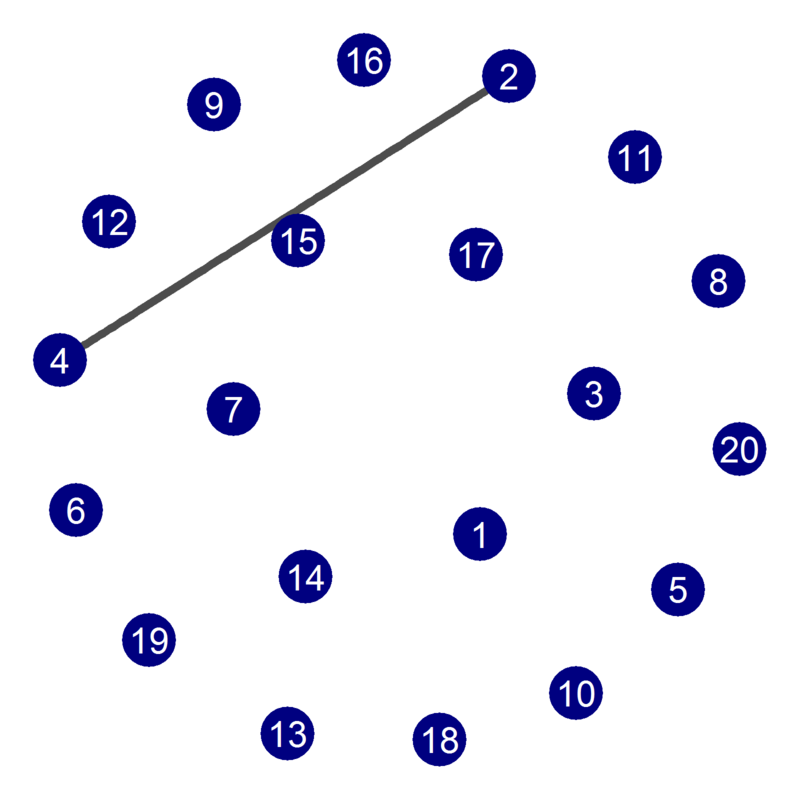 Having posted about the mathematics of dice, here is a way to use dice to teach a seemingly unrelated concept, that of random graphs (also known as Erdős–Rényi networks). 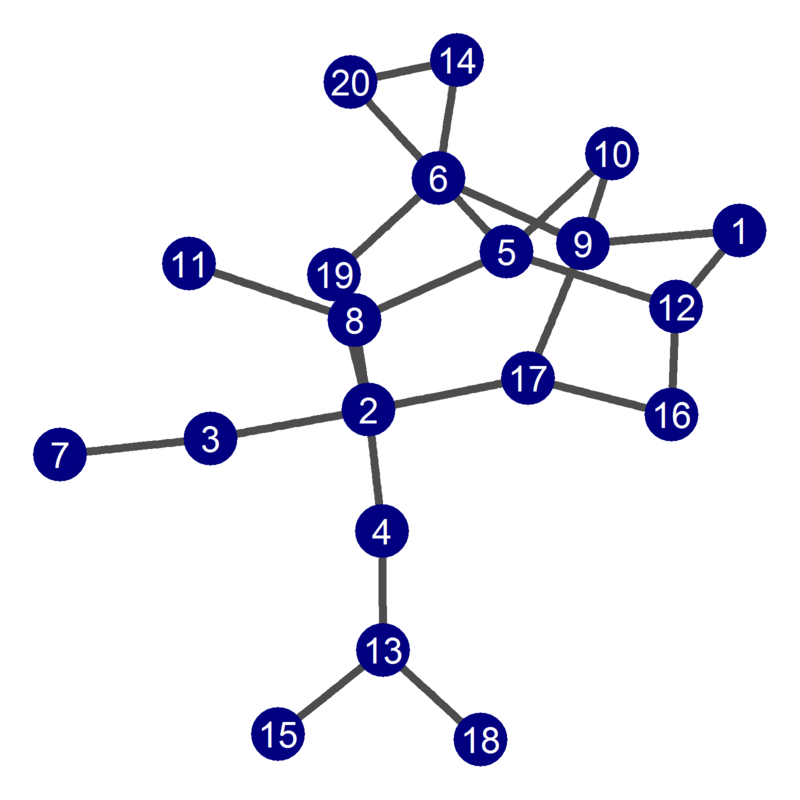 Random graphs are networks where the links are introduced at random, among a pre-existing set of nodes. 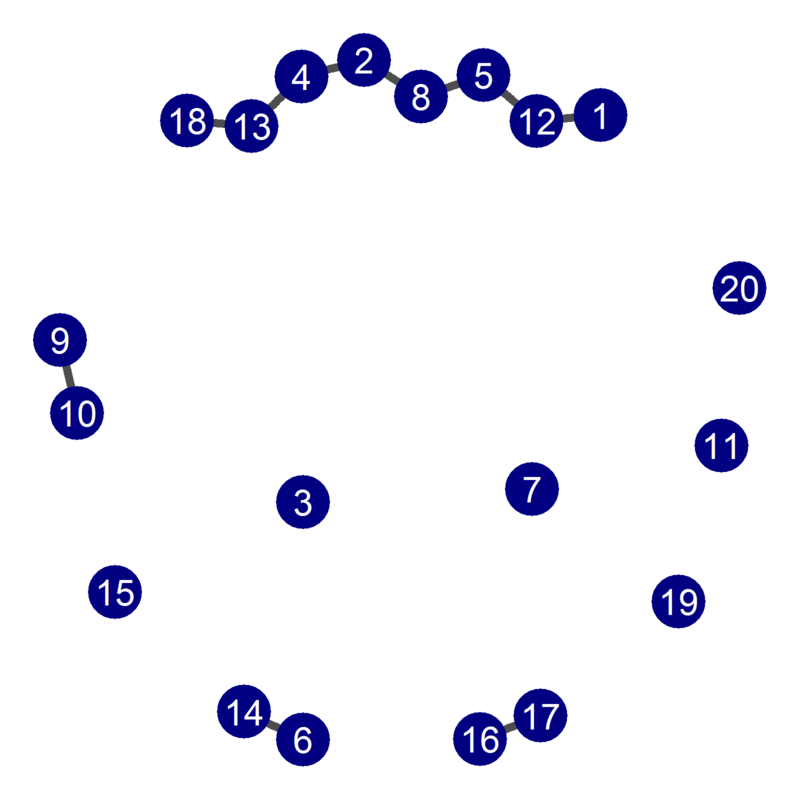 Here, the nodes will be the numbers from 1 to N = 20. The theory of random graphs, described in the classic textbook by Béla Bollobás, is quite beautiful. We keep repeating this process, and at an average degree of 1, something interesting starts to happen. A giant component begins to emerge – one big cluster containing many nodes (accompanied by smaller clusters and isolated nodes). The giant component is more impressive with a larger number of nodes, of course. 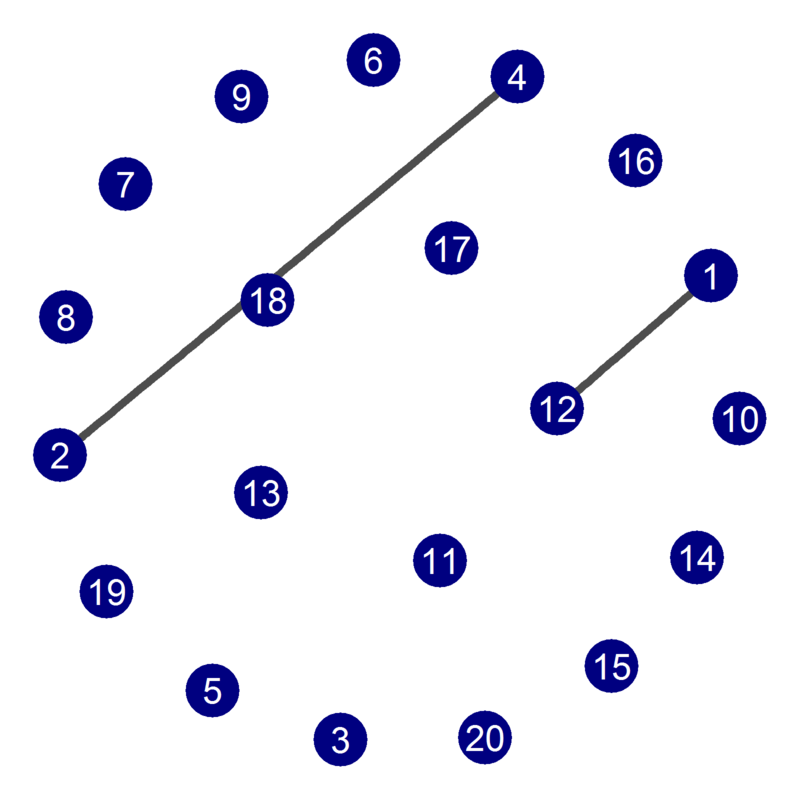 At an average degree of around log(N), taking (natural) logarithms to the base e = 2.7182818284…, enough random links have been introduced that the network becomes connected. 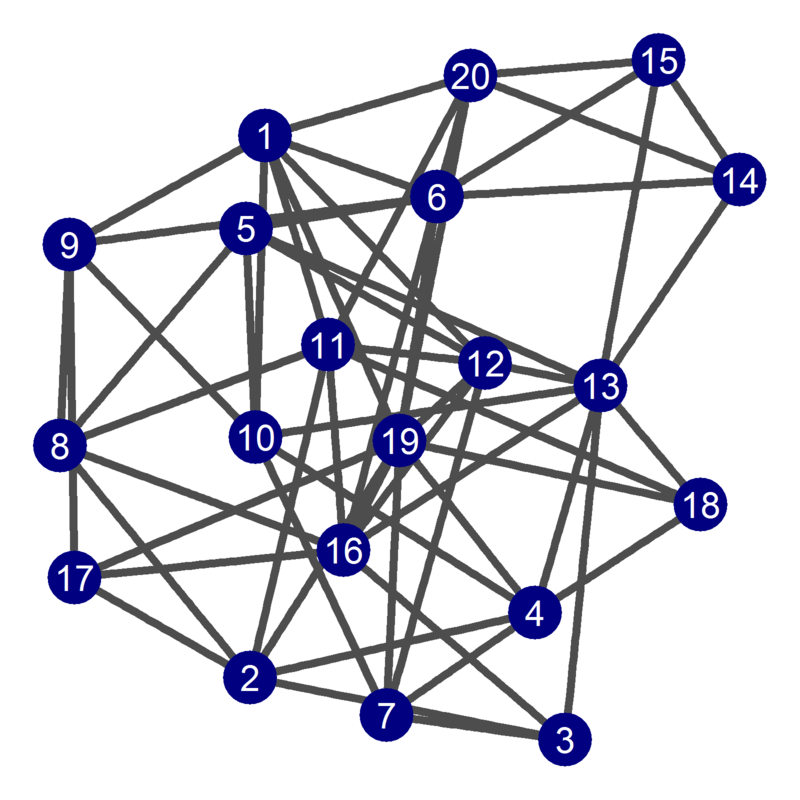 We have log(20) = 3.00, but for this particular set of dice rolls, the network becomes connected at an average degree of 2.5. 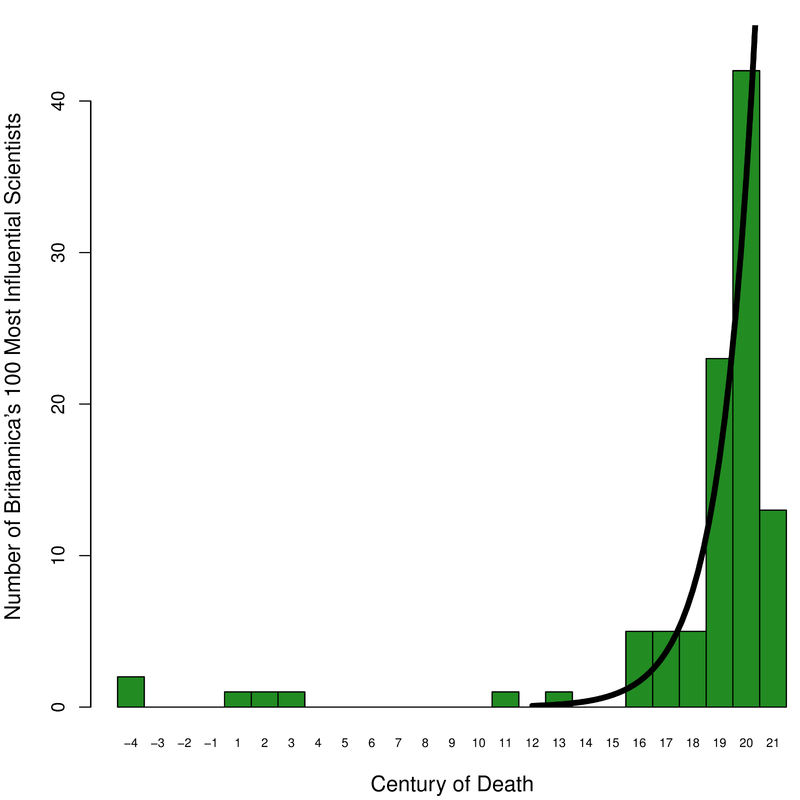 For larger networks, this connectivity threshold becomes quite sharp. 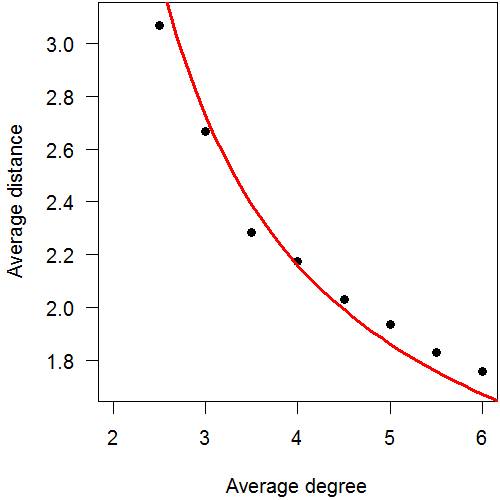 For connected networks with an average degree of d, the average distance will be approximately log(N) / log(d). This function is shown by the red line below (with black dots showing measured values for our set of dice rolls). For large networks, this formula gives quite a small number, and the property of having small average distances is often called the “small world” property. 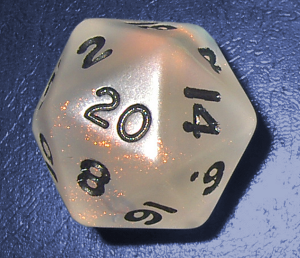 There is much more to the study of random graphs, of course, but we can see that a simple pair of icosahedral (d20) dice is enough to introduce the basics. Solar Impulse 2 (photo above by solarracing.org) is a solar-powered aircraft with a wingspan of 71.9 metres, which will begin a planned around-the-world flight in late February or early March, starting from Abu Dhabi, where the Abu Dhabi Solar Challenge was recently held (and where the aircraft has recently arrived). The video below shows the aircraft’s maiden flight. It will be interesting to see how this goes! The 2015 Abu Dhabi Solar Challenge is over. There was excellent coverage of this interesting event on Twitter, especially from solarracing.org. The race was also covered in local news, and some teams (like Michigan, Principia, and the Belgians) blogged about it. The map below shows where the various teams hailed from. Although I previously estimated the final order, based on times for all three days, here is the order based on official results. Note that Tokai is now in 7th place. 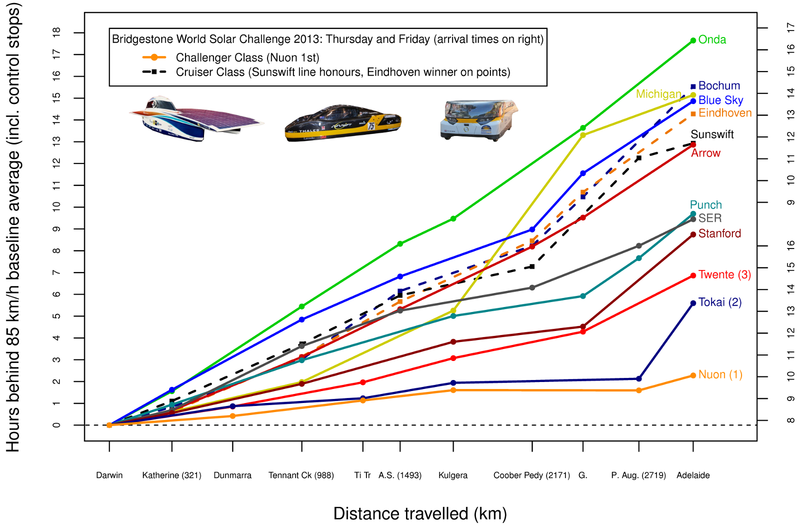 It is worth noting that Punch Powertrain (the Belgian team) were the fastest of the 4-wheel cars, and that the World Solar Challenge, in the Challenger Class and Cruiser Class, requires four wheels. To finish my commentary, the picture below shows Michigan leading the way through the desert yesterday (photo: Noah Kaczor). Well done, Michigan! This post has been updated with official times. 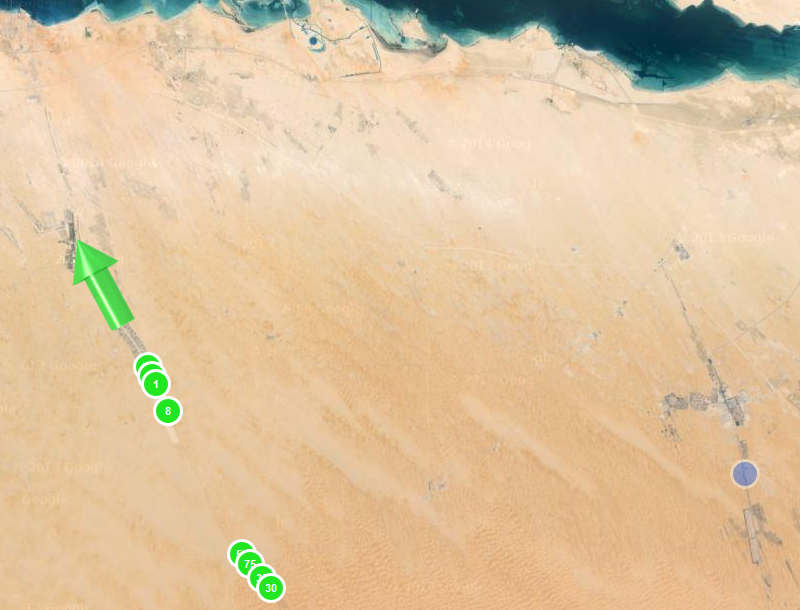 The route for day 3 of the 2015 Abu Dhabi Solar Challenge begins again at the Shams concentrating solar power station (photo below by solarracing.org), runs through historically important Liwa to the town of Ghayathi, and then returns to the power station. Racing on day 3 started early, at 8:00 AM local time. The Shams power station is a 100 MW parabolic-trough solar facility, although it relies on a gas-operated booster heater to increase steam temperature from 380°C to 540°C. 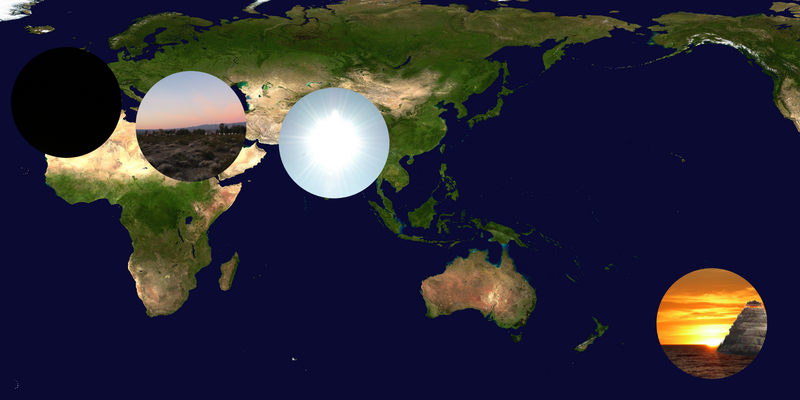 Even just with Google Earth, it looks quite impressive. Being subject to dust storms in its desert location, keeping the facility’s parabolic mirrors clean and shiny requires trucks with robotic scrubbing arms. 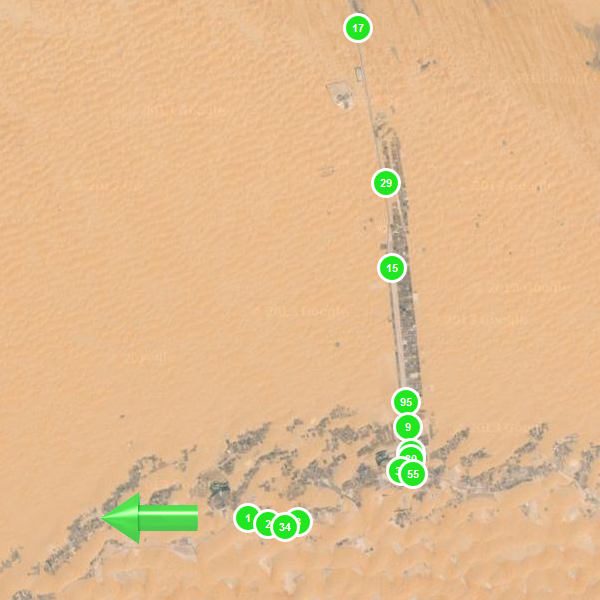 As the map above shows, the current sequence of cars is 1, 2, 34, 8, 32, 55, 30, 75, 9, 95, 15, 29, 17, and 90, with 256 apparently getting a late start (the map also shows the dunes of the famous Rubʿ al-Khali to the south). Only minutes separate the lead cars, so today promises to be a real nail-biter. Update #1: at 9:30 the sequence of cars was 1, 34, 8, 2, 55, 32, 30, 75, 95, 9, 15, 29, 17, 256, and 90. Update #3: at 11:10, on the way back to the start, the sequence of lead cars was 2, 1, 34, 8, 75, 30, 55. The clouds today seem to have made an impact. 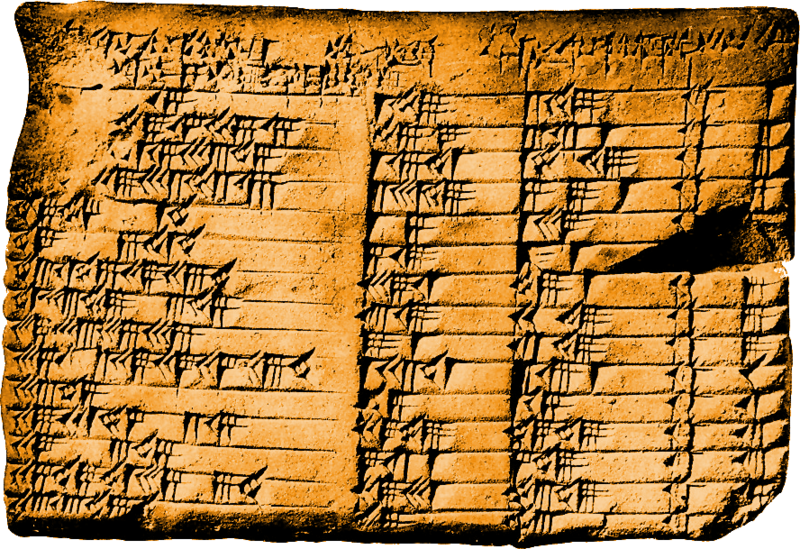 Update #4: at 11:30, the sequence was 2, 1, 34, 8, 75, 55, 30, 32, 95, 9, 15, 17, 29, 256, and 90 – with a real battle going on among 7th, 8th, and 9th. Update #5: the order of the first ten cars across the finish line was 2, 1, 34, 75, 8, 30, 95, 55, 9, 32. Update #6: based on times for all three days, my estimated final order for the top ten is 2, 1, 8, 34, 30, 32, 55, 75, 95, 9. That may vary with penalties and protests from today.